This is the first in a series of blog posts from Robert Van Rensburg on Euro Nymphing. A native South African, Robert has traveled the world, fished in 17 countries, and guided in 4 countries, including in Chile with BSA co-owner Jonathan Heames. Robert’s deep knowledge of Euro Nymphing stems in part from his background in competition angling. He has represented South Africa at 13 World and Commonwealth Fly Fishing Championships, 11 times as the national team captain. Quiet and humble, Robert’s demeanor betrays his level of experience and knowledge when it comes to fly fishing in general, and Euro Nymphing in particular. He loves being on the water, challenging himself to learn new things, and appreciates the beauty of an 8-inch cutthroat as much as the heft of an 8-pound brown. We are lucky to have him working in the fly shop and guiding for us again this summer. Please stop by and chat with him about this fun and exciting style of fishing! For those interested, he will also be conducting a series of Euro Nymphing Masterclass Clinics through the season, with three Saturday dates already set – June 8, August 17, and October 5. More dates may be added depending on interest, so be sure to sign up for our email newsletter so you don’t miss out on that information. Euro nymphing is a form of high sticking and tight line fishing, using longer softer action rods, leaders usually twice the length of the rod or longer and ultra-thin fly lines. 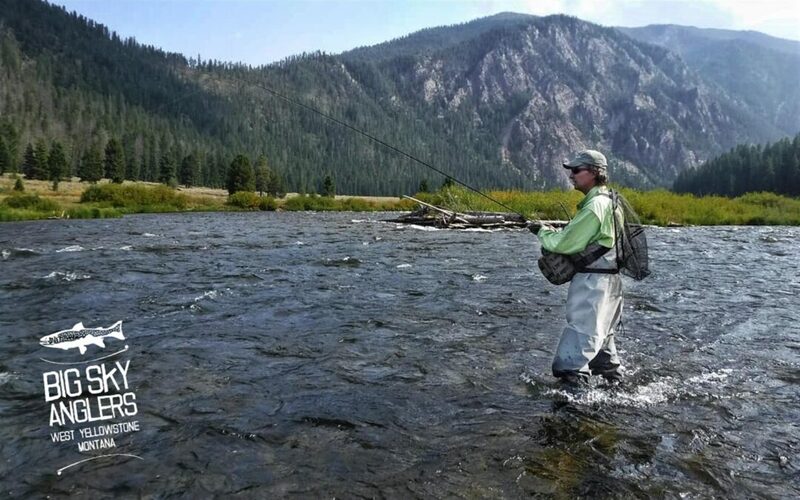 The techniques of Euro nymphing allow the knowledgeable, skilled angler to fish with accuracy and control at varying distances, in all types of water ranging from fast deep runs to slow shallow glides, with heavy weighted tungsten flies, and also with small light nymphs, dries, dry/dropper rigs and even streamers. I work hard at all river and lake fishing systems, from dries to steamers, floating lines to DI 7 sinking lines but I have never fished or seen another collection of techniques that is so versatile and catches more fish than Euro nymphing. Like all fly fishing it takes practice, but the returns are more water types to fish, more fish hooked and many rewarding days on the water. Getting started need not be that expensive. Conventional floating lines have been replaced with purpose made thin diameter, level floating lines, reducing line sag and the need to mend line when fishing at distance. No buoyant strike indictors or split shot are used. With this tight line system, the angler has complete control of the fly line, leader, flies, depth and speed of the drift. You are in constant contact with the flies through the drift. The softest of takes can be detected. It can be fished from fast deep water where floating lines, strike indicators and tapered leaders are a major disadvantage, to slow shallow water where a standard floating line can spook wary fish. There are differences in flies, leaders, techniques and application between French, Spanish, Polish and Czech nymphing. Euro Nymphing is an amalgamation of these methods. In my opinion short line nymphing in faster water (Czech style) is not difficult to learn. It is one of the easiest and best of the Euro nymphing methods to start with. This gives the angler the fundamentals on which to build and progress. The French and Spanish methods are more challenging. Learning to cast and manipulate very long leaders and light flies in shallow water takes persistence and educated practice. Tight line nymphing, of course, is not new. Progressive Anglers like Joe Humphreys have been fishing and teaching the system for many years. That said, the consistent success of the top European countries at the World and European fly-fishing Championships has led to a great increase in the popularity of these methods, and also fuelled new designs and innovations in rods, lines, leaders (35 ft plus leaders that cast like a fly line, used on shallow clear water and very wary fish), casting techniques,’ Tippet materials, sighters (coiled, bi-coloured and wax paste sighters), hook design (to me, one of the most important innovations in fly tying and fishing), weighting of flies from slotted tungsten beads to tungsten bodies, and fishing without shot on the leader. Fly design and selection is paramount to the Euro nymphing approach. This includes intentional selection of hooks and tying materials to create patterns with slim profiles, movement and trigger points. Many of the fly patterns are based less on imitation (matching the hatch) and more on presentation. Preparing tackle, leaders, flies and equipment at home, is another key aspect of Euro nymphing, making your time on the water more efficient, and potentially increasing the catch rate. As anglers we don’t have a say in the weather, water conditions, bugs, etc. but there are many aspects of fishing that we can control. Preparing diligently and with a strategy before a fishing trip allows you to “control everything you can control”. All the points listed above (and more) are covered during my Euro Nymphing Masterclass Clinics at Big Sky Anglers, which take place in our class room at the shop, followed by an on-the-river practical session. In addition to these group clinics, we also offer personal instruction for those who are interested. Big Sky Anglers has many of the fishing and tying products you need to get started available in the shop. If you have any questions on technique’s, equipment, tying materials or flies please visit, phone, or email us.